Camille Pissarro’s Le Quai Malaquais, Printemps (pictured), was owned by a Jewish book publisher in 1938 in Austria. When he fled Austria, the work was lost. A history professor, Jonathan Petropoulos has been involved in attempts to return the works to the descendants. Last week, Elise Viebeck a student reporter at Claremont McKenna College reported that Petropoulos will resign as director of the Study of the Holocaust, Genocide and Human Rights. Yesterday Mike Boehm a LA Times Staff Writer picked up the story as well. Petropoulos said he got involved at the behest of Fischer and the Art Loss Register, a London-based company that keeps a database of stolen art and in some cases helps to get it back. In December 2006, he said, he met in Munich with Griebert, whom he knew as an art-business associate of Lohse. Griebert, the professor said, was now apparently angry with the ex-Nazi. Petropoulos said Griebert told him about papers he’d found showing that Lohse had sold the Pissarro in 1957 to a man who bequeathed it to a foundation in Lichtenstein. Working for what he said was his customary consultant’s fee of $350 an hour plus expenses, Petropoulos said he reported the news to his client, the Art Loss Register, which was then negotiating a contract with Fischer to recover the painting. The professor said he did more sleuthing on his own, with a view to recovering the Pissarro and gathering material for a book. In late January 2007, he said, he viewed, authenticated and photographed the painting in the conference room of a Zurich bank. He also said he dined with Fischer and Griebert later that day and that they reached a deal: Fischer, who’d had a falling out with the Art Loss Register, would sell the Pissarro at Christie’s in New York and Griebert would get his customary 10% art dealer’s fee. Both Julian Radcliffe and prominent restitution attorney E. Randol Schoenberg are quoted as saying Petropolous got himself too involved in the negotiations to return the work, rather than simply do the research for the fee which had been agreed upon. The seems to have been a miscommunication at some point, and the “champagne” agreement that Petropolous thought he was entitled to rely upon was it seems not reduced to writing, and in return Petropolous refused perhaps to continue to bring the parties together. The ultimate issue I suppose is what kind of compensation these kinds of experts can and should claim. The lawyers involved, and the Art Loss Register all take a healthy commission; and Petropolous certainly seems to have been amply compensated for his time at $350/hour. Though there may be powerful historical, legal and ethical arguments compelling the restitution of these Nazi spoliated works, we should perhaps bear in mind that it is the very large sums of money they fetch at acution which is driving these restitution efforts. Elise Viebeck, a student writer for the Claremont Independent has an outstanding article about the conflicts of interest which arise when history and art history experts are brought in to assist the heirs of victims who lost valuable art to the Nazis during World War II. She details the actions of a CMC History Professor, Jonathan Petropoulos. The article asks an important question: How should these experts, whose specialized knowledge can bring about the restitution of ultra-valuable masterworks be compensated? Swiss prosecutor Ivo Hoppler raided a Swiss safe in the Summer of 2007 as part of a “three-nation probe of a German art dealer accused of conspiring with an American at historian to withold a painting by French impressionist”. I talked about the discovery of the work at issue, Camille Pisarro’s Le Quai Malaquais, Printemps last summer, but was unaware of this controversy. The story of the Pissarro begins with Zurich resident Gisela Fischer, 78, who is of Jewish descent. She and her family fled Vienna in 1938 two days after the Nazi Anschluss. 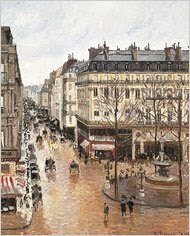 The Gestapo looted their home, and among the stolen items was a painting by impressionist Camille Pissarro, Le Quai Malaquais, Printemps. After the war, Fischer’s father successfully located and reclaimed many of his family’s stolen assets. After her father’s death in 1995, Fischer concentrated her efforts on the Pissarro which had remained elusive. In early 2001, she registered the painting with the Art Loss Register (ALR), a London-based for-profit company involved in stolen art recovery. The foundation, he wrote, wished to remain anonymous. For the Pissarro case, Radcliffe proposed an elaborate compensation scheme, including 20 percent of the first $1 million, 15 percent of the second million and 10 percent of any additional value of the painting. Included in his price was a stipend for Professor Petropoulos, who had requested $100,000 from the ALR for his services. Radcliffe and Sarah Jackson of the Art Loss Register also went to Zurich, only to find themselves excluded from the dealings. “We went expecting to be included in the meetings with Ms. Fischer only to discover that they had already had meetings without us. We realized we had been cut out,” Radcliffe told the CI. At the hotel, Petropoulos and Peter Griebert, a Munich art dealer, showed her digital photos of the Pissarro, claiming to have taken them that morning. According to an account published in ARTNews magazine, they did not give further details about its location or the identity of its owners at that time. It’s a very interesting account, and I don’t think Petropoulos, nor even the Art Loss Register are painted in a favorable light based on this account. Though much nazi restitution litigation rests on the assumption that the law should compensate the victims of the holocaust and other misappropriation, the engine driving these claims are the large sums of money these works can bring at auction. I think an interesting issue which needs to be researched in more detail is how and to what extent these restitution experts owe a duty to claimants. Bruno Lohse, a German art dealer appointed by Hermann Goering to acquire looted art in occupied France, dispersed his private collection of Dutch 17th-century masterpieces and expressionist paintings among friends and relatives in his will, the lawyer handling his estate said. Lohse died on March 19, aged 95, and has since become the focus of a three-nation investigation into a looted Camille Pissarro painting discovered in a Swiss bank safe that was seized by Zurich prosecutors on May 15. The painting’s prewar owners said the Gestapo stole it from their Vienna apartment in 1938. Lohse controlled the Liechtenstein trust that rented the safe. “Paintings have been willed to relatives and friends in individual bequests,” Willy Hermann Burger, the executor of Lohse’s will, said in an interview at his home in Munich. Burger, who declined to name the beneficiaries or disclose details on individual artworks, said he’s sure none of the paintings in Lohse’s private collection are looted. Lohse became Paris-based deputy director of the Einsatzstab Reichsleiter Rosenberg, the Nazis’ specialist art-looting unit, in 1942, according to the interrogation report compiled by the U.S. Office of Strategic Services’ Art Looting Investigation Unit, which questioned him in Austria from June 15 to Aug. 15, 1945. The E.R.R. plundered about 22,000 items in France alone, according to the O.S.S. reports. The Jewish Claims Conference estimates that the Nazis looted about 650,000 artworks in total. “There is a lot of art still missing and we believe that a significant proportion remains in private collections, especially in Germany and Austria,” said Anne Webber, co-chair of the Commission for Looted Art in Europe, a not-for-profit organization based in London that helps families recover plundered property. Adding to the difficulty is the fact that Lohse became an art dealer in the 1950’s, and thus most of his private collection is probably legitimate. However, the Pisarro found in the Swiss bank vault, Le Quai Malaquais, Printemps is probably looted, at least according to the Art Loss Register. This all underscores the importance of establishing and checking provenance for works of art when they are sold or donated. If the various European prosecutors are not as aggressive as their American counterparts have been, a lengthy and complex legal dispute between the successor and the descendants of the original1938 owner will likely ensue.